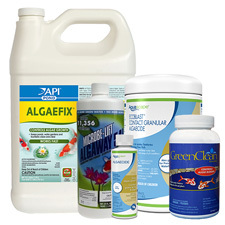 Effectively eliminate many types of green water algae, and string algae in self-contained ponds with liquid algaecides. Aeration must be continuous to prevent fish loss. Dry concentrated formulas utilize the latest in oxygen technology to remove string algae quickly and efficiently from streams and waterfalls- best used as a spot treatment. Use tablets as a preventative in ponds and fountains.